For those who know Neil Finn from Split Enz and Crowded House and his solo work will recognize his New Zealand-esque voice and style. 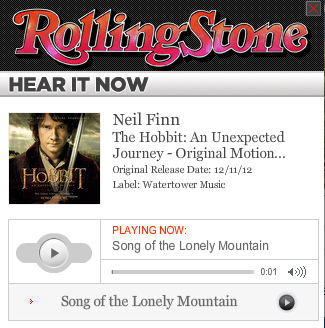 This song will be on the official soundtrack for The Hobbit, out December 11, 2012. Click the pic above to open a new window to start playing the song. And yes, I am excited to see the movie, too. I can’t wait for the movie. Although I must admit I had a terrible time getting through the book. I forget if you mentioned it on Twitter or not, but did you see The Hobbit?